On April 26, 2015, Corinthian Colleges, Inc. announced that they had ceased operations at all Heald, Everest, and WyoTech campuses following oversight and enforcement actions. This left thousands of students without a college education and in debt. Has your college closed? Do you have student loans? Cal Grants? We can help. 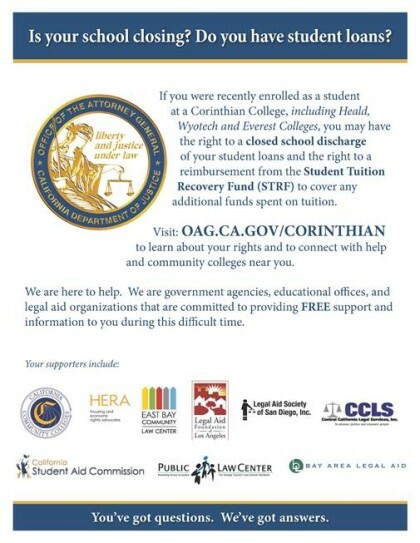 The Peralta Colleges and the State Chancellor’s Office, the California Office of the Attorney General, the California Student Aid Commission, the East Bay Community Law Center, and others, are here to provide you with information and resources you need to finish your college education and get out of dept. We will host a LIVE interactive video event on Monday, May 4, 2015 from 1:00 p.m. to 2:00 p.m. (PST). Join us from your computer, smartphone or tablet. To participate in this LIVE video interactive event, here is the link: https://event.webcasts.com/starthere.jsp?ei=1063614.